We are ready for a new home! Will you help us achieve this dream? How can you help? Take a few minutes every Monday at 1:30 to pray for Live Oak's home. For the next 21 months join us for a day fasting on the 21st of every month. Pray about and commit to donate to the HOME GIFT. By the end of the year our goal is collect $100,000. This will allow us to send $50,000 to our compassion partners in the Ukraine and Thailand. The remaining $50,000 will be used to start developing plans for our new home! Join us Christmas Eve morning at 10:00 at the Ministry Center to put together goodie bags for those who have to work that day! Then at noon, help us spread some Christmas Cheer by delivering the bags to stores, restaurants, police station, etc. This is a great service project for families, and a great way to keep the kids busy for a couple of hours! 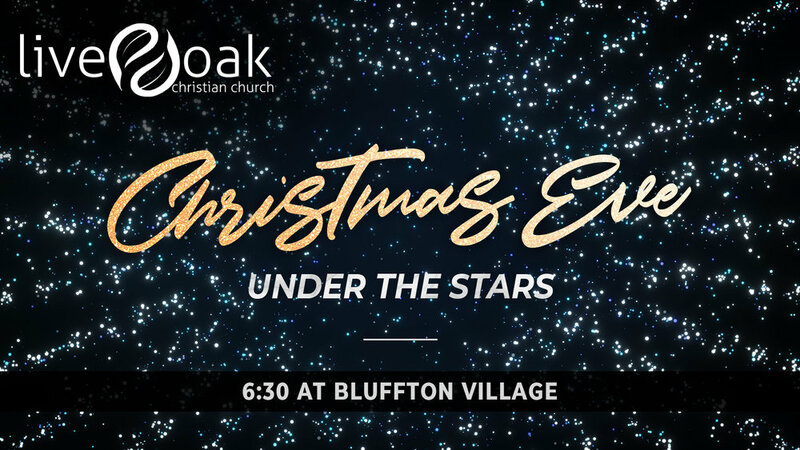 Our Christmas Eve service this year will be on our property in Bluffton Village! We will start at 6:30pm. Bring your own chairs or a blanket, get comfy around a fire pit and join us in singing Christmas songs and hearing the Christmas story. We will have hot chocolate (or lemonade, depending on the weather) available. If it rains, we will still have our program at the Bluffton School of Dance. Bring your friends and family and let’s celebrate together.